Deviled eggs don’t have to be boring! These Bacon Cheddar Deviled Eggs take picnic food to a whole new level! Deviled eggs and picnics seem to go hand in hand. And because deviled eggs are the quintessential summer appetizer, I had the perfect reason to play around with different flavor combinations. I hit the jackpot with these Bacon Cheddar Deviled Eggs. After all, how can you go wrong with bacon AND cheese?? I used to be intimidated to make deviled eggs, but don’t be fooled; it’s easy to make gorgeous ones like these Bacon Cheddar Deviled Eggs. Simply place the egg filling in a plastic resealable bag, clip the corner and pipe into the egg whites. (Using a plastic bag makes clean up a snap, too.) Just before serving, sprinkle the tops with freshly chopped chives or paprika and you have a picture-perfect appetizer that looks like you bought them at a deli. And you can take all of the credit. 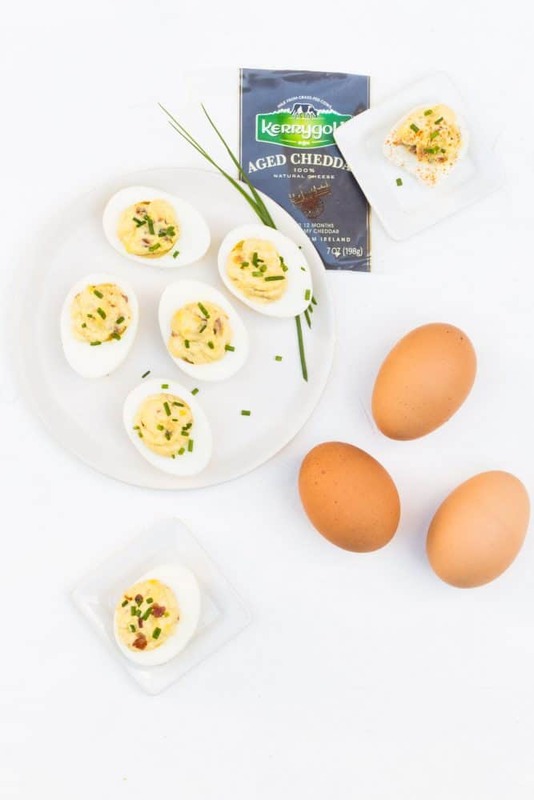 Each bite of these delicious Bacon Cheddar Deviled Eggs is filled with smoky bacon and my favorite Kerrygold® Aged Cheddar Cheese. The rich cheese and smoky bacon complement each other perfectly. Even people who don’t eat deviled eggs devour these. One bite and people will beg you to make them again. And now that you know how easy and delicious they are, you will happily oblige. Make-ahead tip: Prepare the egg filling the day before and refrigerate until ready to fill egg whites. Tip: Need to make perfect hard boiled eggs? We show you how here! Slice eggs in half and remove yolks. Place yolks in a small bowl and mash with a fork. Stir in mayonnaise and mustard. Stir in bacon and grated cheese. Season to taste with salt and pepper. Fill sliced egg whites with filling. Garnish with chopped chives or paprika. Refrigerate until serving. 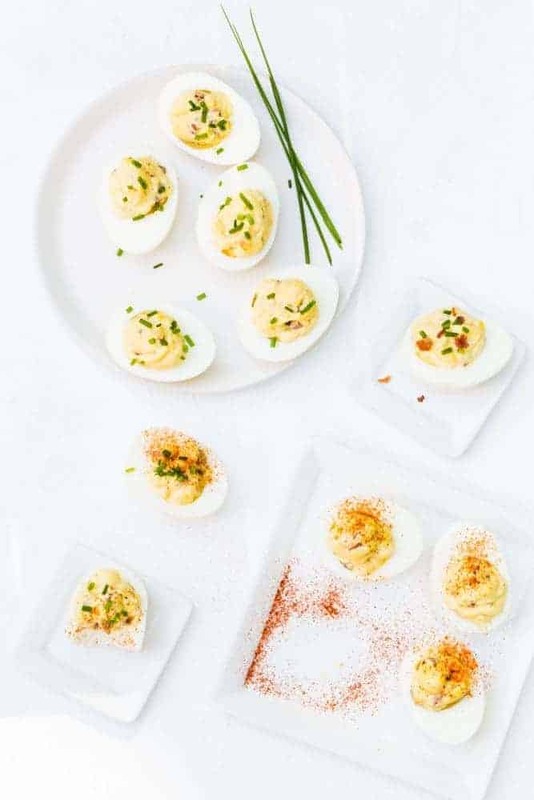 Looking for more ways to eat deviled eggs?